Another one of those childhood memories. Mom would start to make the Caponata and Dad would fry the Bologna. So many versions from many different kinds made of Caponata. Every part of Italy seems to make this a little different. 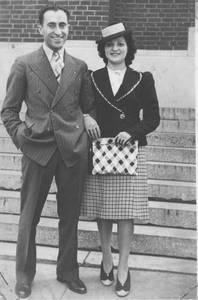 This was the Barese style, where mom's family was from. Dad was from Rome, not sure who started adding the fried bologna, as that came later, but we loved it. The Caponata could be served so many different ways after it was cooked, the fresh Italian bread always makes the sandwich that much better, and at that time we never had bread that wasn't freshly made out of the oven or hot from the bakery where Dad worked. Mom worked at a local supermarket and sometimes would bring home their bread. It was always so funny to see Dad face. Dad would always check the inside of the bread and pull out a piece from the middle and if he could roll it in a ball , then he would say "this isn't cooked it doughy" and off he'd walk to get us another loaf fresh, from a local bakery, he knew good bread and wouldn't use anything else but good quality Italian bread, he really appreciated homemade or from the Italian bakeries. The eggplant, garlic, celery, olives, capers, tomato and of course a little vino, really made this an awesome sandwich by itself, then adding sauteed Bologna...oooooo the smell alone would be hard to wait to eat this delicious sandwich. Sprinkle the eggplant with the salt after prepared and washed and let stand in a colander for 20 to 30 minutes. Run under water then blot dry. Heat the olive oil over medium heat in a large fry pan. Place the eggplant in the pan and cook, until soft and tender, about 25 minutes. Remove the eggplant from the pan. Add the onions and garlic to the pot and cook, stirring often for three to four minutes, or until soft. Add the tomatoes, paste celery and green olives. Cook for about 15 minutes or until the celery is tender. Return the eggplant to the pot. Add the capers, wine and sugar heat till sugar is dissolved. Pour over the eggplant mixture. Season to taste with salt, black pepper. Cook over medium heat for about 20 minutes, stirring occasionally. In a separate fry pan, cut one pound of bologna up into square pieces. Fry until golden and some of the edges are crispy. Just before the Bologna is done add 2 cups of Caponata to the bologna heat thoroughly. At this point you can get some thick Italian bread to make your sandwich. This Caponata can also be served plain without the meat over pasta, on garlic toast, or over rice. I haven't ever had your version of caponata but it looks great! I have made Giada's version a couple times, now I'll have to try yours ! Your caponata looks gorgeous- I love eggplant! What really has me fascinated about this is the bologna part of the sandwich; what a hoot! I have some mortadella (not exactly bolgna, but close) in the fridge leftover from a holiday meat tray and I just might have to run out for an eggplant today. This is going to be dinner tonight! Looks great! I've never tried it like that. I love how each family has it's own twist on the original; that's what makes it so good. Happy New Year. @Kristen thanks for your comment, I always like to see the varietys of different food people grew up with that is what makes them special. 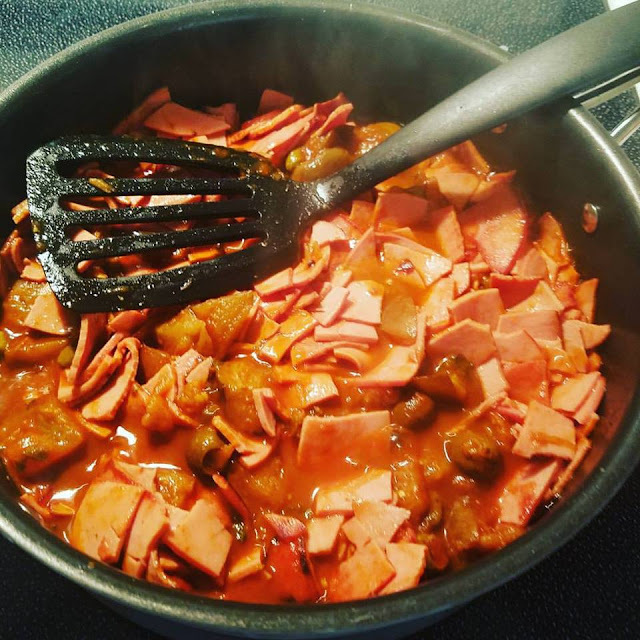 I've never seen this dish before but my husband loves fried bologna so I had to check it out. He is always up for a good sandwich - I think he'd really like this. I love caponata! And am very fussy - do not like it when the eggplant gets mushy. Mine sounds similar to yours - although never had it with fried bologna! Live and learn. Sounds delizioso. Happy New year, Claudia. I left something for you on my blog. ve a blessful & prosperous new year. Cheers. Congratulations on Top 9 with this! I actually made this for lunch the other day using that leftover mortadella I had and it waas AWESOME! This caponota would be great tossed with penne, too.